I want to go on record as thanking Little Debbie for their recent price increase. The cost of goods is going up across the board, and all companies have to transfer their increased cost to us, the consumers, if they are going to stay in business. Many companies, however, are trying to hide it from us instead of being straight up about it. To many are WalMarting it. Keeping the price the same, but shanking us with less product or quality for the same price. If you don’t believe me, look around. For the longest time, soda in the plastic bottle was 20 ounces, but if you check you can find 17 point something and 16 ounce bottles all over. Or get out an old peanut butter jar and compare it’s actual size with a new jar that looks at first blush to be the same, and check out the new wine-bottle-like dimple in the bottom which occupies space that used to be occupied by product. The companies say that we want this, that we don’t want prices to go up. They are right that we don’t like higher prices, but it’s wrong for them to use tricks to prey on our fragile mental accounting systems. (Your brain is, SURPRISE, not logical and thorough all of the time.) They are counting on us looking at price only. We tend not to check the weight because it’s ‘always been the same, and while we comparison shop on price per ounce fairly well, we do not remember what the price per ounce was a week ago, much less last year. And who keeps a log of how long their t-shirts last before they get cut up for rags. So they creep the price up without us knowing, and we wonder why we are shorter on money. I called it WalMarting before, because they have done a good job of training us up to think in the ways that allow this. They’ve got even the best of us tending to look at prices instead of price per unit of function. If you had tried to sell some of that crap in the 50’s, you would have been laughed out of town. Sure, the shoes cost half as much, but they only last a third as long, if that. By the way-Our overfull landfills are a by-product of this mentality. If you really want to ‘go green’, the easiest way is to buy furniture that you can leave to your children instead of stuff you have to throw away in 3 years. It costs less in the long run, and it will impress the heck out of the Joneses. The old mantra of caveat emptor is still in effect. It’s time to pay close attention to the business of life and make smart decisions, or the current economic problems will feel even worse than they are. Walk down any street in this beautiful land and you will hear someone say, “The thing that this country needs is…..”. The answers vary but the approach is quite common. There are lots of ideas out there and some of them are really great. P. T. Barnum once offered his view when he said, ”What America needs is a good five cent cigar!” One would assume that five cents would buy a great deal more in the 1930’s than it does now. Be that as it may, I would like to offer my own version of what America needs. What America needs is a few good spokesmen/women; people who truly believe that this is the greatest nation on earth. From the earliest days of this country our forefathers spoke of this land in glowing terms. Our leaders were spokesmen for Liberty, God, and Country. Today our country and our religion are both under attack from those who would change America into something it never was and was never intended to be. That assault comes from without and within. I can understand the denigration that comes from without. Foreign Countries look upon us with both envy and desire. They covet our freedom, our lifestyle, and our economic system that gives every man an opportunity to be whatever they wish to be. We can deal with our enemies but God Save Us From Our Friends. The greatest threat that America faces comes from within; from America itself! We appear to be bent upon our own destruction. We seem to be determined to destroy the wonder that we have built. The basic principles that created this nation always included The Almighty. When we were first a foundling and later as an emerging nation worship and faith in our Savior were to be found everywhere there was any public gathering. A prayer to God was the first thing on the lips of our elected officials and the last words uttered by a soldier before going into battle. The Constitution guaranteed the separation of Church and State but it said nothing to discourage the practice of that religion. Today both our country and our religion are under attack from every direction. There are those inside this country who are determined to change our nation into something that it was never meant to be and they will do so by any means, fair or foul. The principle approach seems to have two prongs, both of which attack America at the most basic level. First, attack our religion, then attack America itself. Virulent attacks have come from both areas; from those who use the constitution, the schools, and even the courts against their own homeland. Every human being needs something beyond him/herself to believe in. Without faith there is nothing! We need to believe in this country that our sons and daughters are called upon to defend. We must believe in our God, by whatever name you may call Him. We are still the wealthiest and most powerful nation on earth. We are also the most generous sovereignty on the planet. We are a GOOD COUNTRY. And now I will presume to tell you once again what America needs. We need a few good spokesmen/women. We need people who believe in US. We need people to stand on the street corner or on the mountain top and yell, “I LOVE AMERICA!” We need an Evangelical Outpouring. We need a return to our basic beliefs. Dear God, I love this country. If America doesn’t please you there are boats and planes leaving here every day! Thought For the Day: Forrest Gump said, “Life is like a box of chocolates.” If that is so let us eat it slowly, savor every bon bon, and hope that it lasts! Introducing New Author: John Fleming! While we do accept submissions from a variety of sources, our newest author happens to be my father. Dad has been writing for my entire life, sometimes in a column titled The Hue and Cry for various papers, sometimes as a sports writer. Dad’s Books on engines are located underneath his photo here. Sometimes Dad talks about all the different lives he has lived. He is referring to all his many professions as an insurance company manager, as a small business owner, as a charter boat Captain and a Captain for oil company ships, as a County Commissioner, as a teacher, as a sports writer. The list goes on and there is no telling what he will choose to write about. Stay Tuned! Earth hour is a World Wildlife Federation sponsored event where everyone is encouraged to turn off all non-essential energy consuming devices for an hour to call attention to current levels of energy consumption and light pollution. I’ve followed the event and sometimes observed it since it was launched in 2007. It was observed on March 28 last year when the media reported that it saved 4% the previous. However, 4% of what was not explained. Was that 4% of what would have been consumed that hour, that day… It would be nice if the media gave enough information for the numbers they quote to be meaningful. The Earth Hour web page is a little more exact. There were informative and comparative numbers on Canadian participation for instance. Ed Norton was the spokesperson interviewed on television program I watched that Saturday morning. A guest in my home was angered by the whole thing. He said that a lot of people did something like this just to feel better about themselves and it did more harm than good because they felt like they had made a difference when the only thing that would actually make a difference was catastrophic change, prohibitive cost, or force. I recognized that he had a point. For instance, people changed their driving habits while feeling extremely vulnerable during the recent gas crisis. Then, as soon as prices and supply normalized, habits slowly reverted fairly nearly to what they were before the crisis. However, I put forth the optimistic view that sometimes activities like this changed perceptions and that sometimes actions followed and change was possible. I have known people who made permanent changes, both large and small. He repeated himself, louder, more emphatically and with more words. I do give him that he had some people pegged 100%, but hope that wasn’t the entire picture. Previous years, we did not drive down town to see what Atlanta looked like during the voluntary outage because it seemed at crossed purposes to use extra energy driving 25 miles one way to witness the energy conservation. Participation was definitely not large enough to improve night shy viewing in the metropolitan area. This year we combined purposes and made the trip. 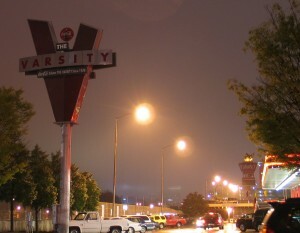 The lights were off on the big Varsity sign by the interstate. They were off before Earth Hour began so we asked the drive-in waiters why, just to be sure it was related to the event. They did not know why the sign was not lit. The large Biltmore signs went off on time, first one and a few minutes later the other. The mega screen at the W went black. The city did look different, but I wondered how many people actually noticed. It seemed perhaps, that even participating companies hadn’t shared the participation with their employees. When I remembered Earth Hour 2010, I checked to calendar to see if it might fall while we were in the wilderness. Not quite, our primitive camping trip in the Dry Tortugas, an adventure with ultra low energy consumption and extremely little light pollution set in the shadow of Historic Ft. Jackson ended just a bit early. I don’t know what media coverage was like this year. I didn’t have access to media in the days leading to the event, but it was easy to appreciate the Earth Hour goal on the island given the night time darkness and the distance from populated areas. We were so near to the nesting sites of terns, frigate birds and sea turtles and the stars were bright. My cup runneth over. As it turned out we were back in civilization on Marco Island, Florida with family during the actual observance. I saw no signs that Earth Hour was being observed there, but I had been away from media for days and I forgot to look. We did take a nice night stroll down the beach with the children and I later thought it nice that we were, in a way, observing Earth Hour while at the same time having forgotten it. Earth Hour participation and awareness grow each year. It will be interesting to see how things develop. As growing numbers of people see that growing numbers of lights have been turned out, they will find out why. Wouldn’t it be nice if awareness grew to a level where everyone could observe an Earth Hour without consciously seeking it? I hope that each year I get another chance to walk on the wild side, regain a little of my night vision and appreciate life off the grid, whether that happens in a premeditated group setting or quite by accident, and I wish you nothing less. For more information check these sites.